The Gothic style appeared in the XII century in the North of France and was introduced in Spain over the pilgrims’ routes to substitute the Romanic style. The great innovation that brought this architecture was the pointed arch, a revolutionary construction that allowed the raising of lighter buildings, much higher and luminous than those of the Romanic period. Thus, some of the most impressive buildings that we can find all around the Peninsula Iberica are built of this style predominating in Spain until the XVI century. 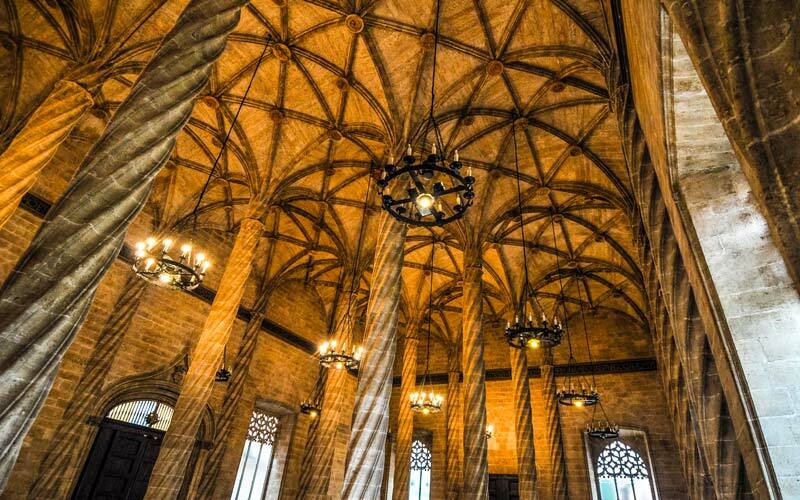 Today we present you five of the best examples of the Gothic style in Spain. One of the temples with the biggest Gothic style in Spain, despite of its following constructions, is the cathedral of the city of Burgos. This is an amazing Gothic colossal cathedral you cannot skip visiting. Its construction started in the XIII century following the parameters of the Gothic French style and being inspired by the Reims Cathedral. Due to the drop of one sculpture in its facade there were set restoration works to recreate the cathedral in the same way it was created by the first time. 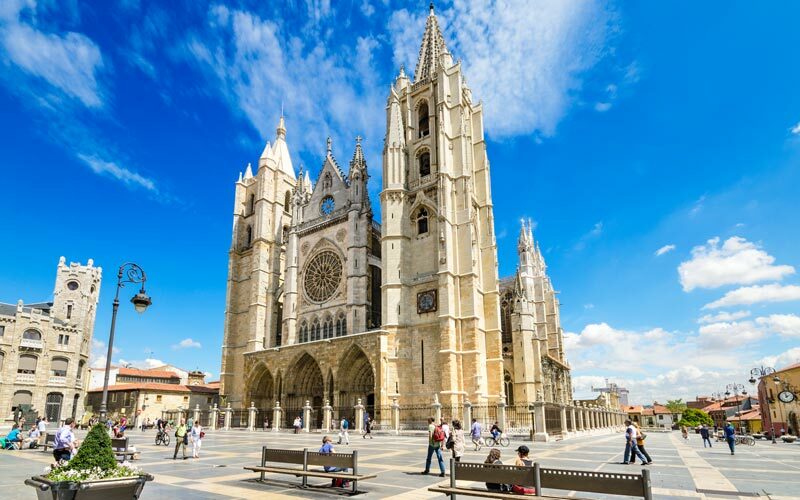 Other treasure in this kind of Spanish Gothic architecture is the Cathedral located in the city of León, which is along with the one in Burgos, an important stop in the Route of Santiago. Its construction, which started in the XIII century, was leadered by the professor Enrique, who worked as well in the Burgos Cathedral. This building, known as “La Bella Leonesa” (The Beauty from León) has the most characteristic Gothic element: the elimination of walls substituted instead by colorful stained windows that create a special environment in the interior, making up one of the biggest medieval stained windows in the whole world. The economic prosperity in the East of the Peninsula during the Middle Ages fomented the construction of Gothic style civil buildings in regions like Catalonia and Valencia. We are talking about the Lonja de la Seda in the city of Valencia, one of the main monuments of that time. It is an impressive Gothic construction due to its lush decoration and creative design. It is especially remarkable the “hiring hall”, or “columns room”, where eight impressive helicoidal pillars hold the ribbed vaulting. By the end of the XIII century and during the XIV century the historical circumstances due to the different peninsular kingdoms, fomented the apparition of variations from the Gothic style because of the different ways of using the architectonic and decorative elements. 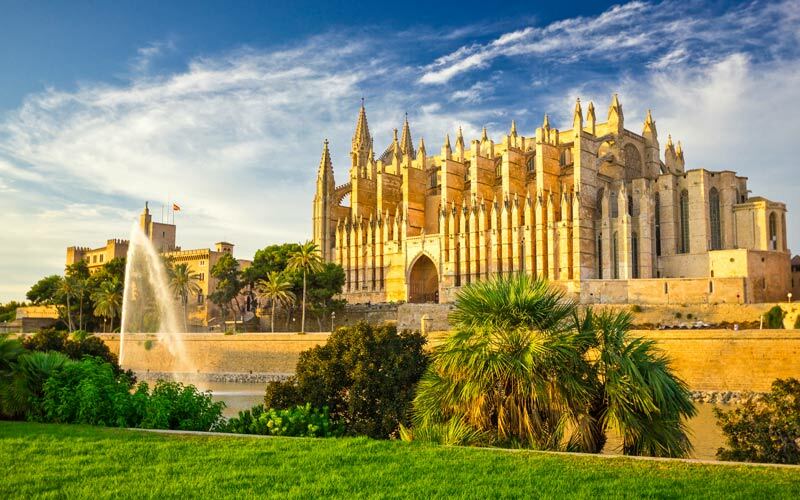 The most important of these variations was the Levantine Gothic style, style of the Palma Cathedral and some of the Mediterranean regions during the XIV century. 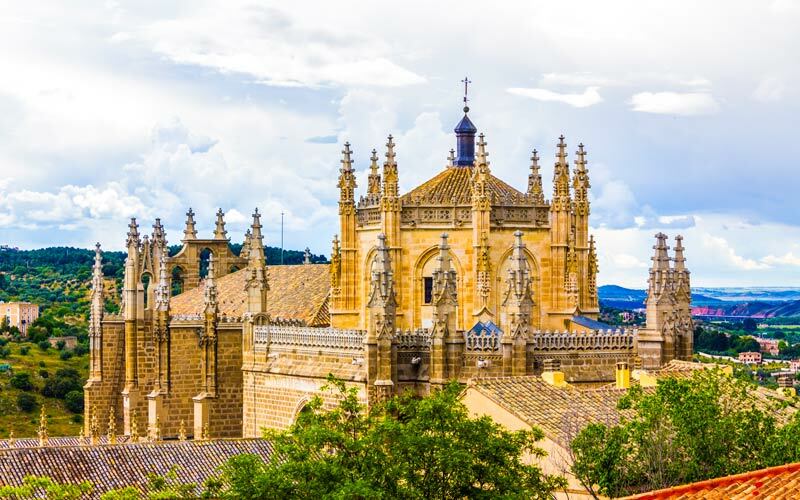 In the main temple of this beautiful city we see some of its most important characteristics, like the lacking decoration on the walls and the verticality, being one of the highest cathedrals in Spain with 44 meters in its central nave and the one with the biggest Gothic rose window. With the arrival of the Catholic kings, the last phase of the Spanish gothic style appeared right next to the Renaissance: The Isabelino Gothic style, which most remarkable building is this amazing monastery that the kings ordered to build in the city of Toledo (city that also has an amazing Gothic cathedral). This building commemorates the Bull battle and it pretended to be a royal mausoleum, reason why it is merely decorated with Castellan, Muslim and European elements being part of this Isabelina phase. In this way the building is an amazing place that commemorates wonderfully these Catholic kings.